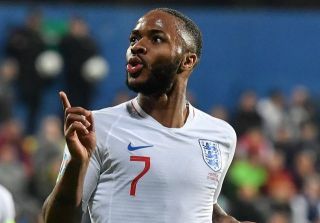 Raheem Sterling put in another brilliant display as England ran out 5-1 winners over Montenegro in their Euro 2020 qualifier on Monday night. The Manchester City star has been in excellent form again so far this season, scoring 19 goals and providing 16 assists in 40 appearances for Pep Guardiola’s side. He took that form into the international break with key performances in the back-to-back qualifiers, and even grabbed a goal for himself in the win over Montenegro late on to cap off a comprehensive victory. As noted in the BBC 5 Live Sport tweet below though, it had been reported that there were some racist chants from the home crowd, which simply isn’t acceptable. However, after silencing them in the best way possible with a goal, Sterling seemingly directed his celebration at them too, as seen in the image below as he cups his ears and faces them directly. Sadly, it isn’t the first time that he has had to deal with such disgraceful behaviour, and it’s just hoped that it can somehow be stamped out moving forward even though that has been said for years and yet it seems to rear its ugly head one too many times. Nevertheless, England boss Gareth Southgate confirmed in his post-match interview with ITV Sport that the FA will report it to UEFA, and so it remains to be seen what action is taken. FT:#MON 1-5 #ENG@England score FIVE for the second consecutive game! ??? After racist abuse directed towards some of the #ThreeLions players, Raheen Sterling quietens the crowd with the fifth goal ?? ?